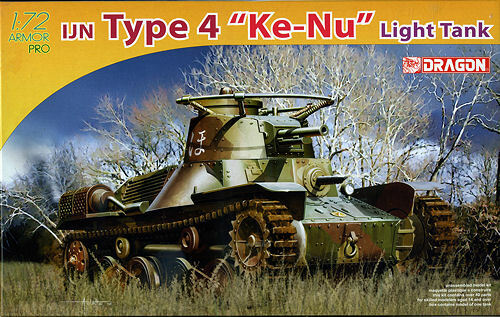 The Type 4 Ke-Nu was a side effect of the on-going development of the Type 97 Chi-Ha medium tank. The original Type 97 Chi-Ha had been armed with a low muzzle velocity 57 mm tank gun. Operational experience in Manchukuo, China in the early stages of the Second Sino-Japanese War and against the Soviet Union at Nomonhan during the brief Japanese-Soviet Border War in 1939 revealed that this gun was totally inadequate against any form of opposing armor, and a new higher velocity 47 mm tank gun was developed. 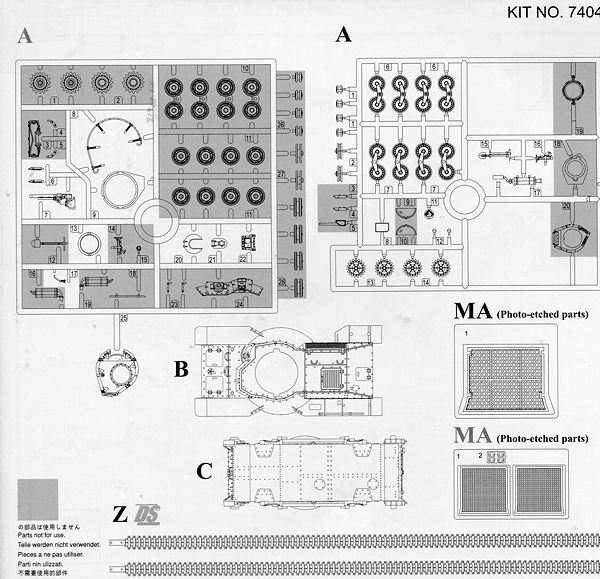 This was then installed in the Type 97 Chi-Ha medium tank to produce the Type 97-kaiShinhoto version. This left a large number of surplus Type 97 turrets, which were later retrofitted onto the hulls of the obsolete Type 95 Ha-Go light tank. The result was designated the Type 4 Ke-Nu. In total, approximately 100 units were converted in 1944. This new kit from Dragon is basically a mixture of two previous kit. Take the basic automotive section and lower hull of a Type 95 Ha-Go tank and add the turret of a Type 97 Chi-Ha. Presto, a Ke-Nu! It really is as simple as that. This kit has sprues from both kits included and it means a lot of pieces from one sprue that are not going to be used as you really only need the turret bits from it. Fortunately, this leaves the easier to assemble running gear of the Type 95. Not only are there extra plastic bits, but also extra photo etch. Two small frets are supplied from which you use the muffler shield that is on one fret, and on the second, you only need two small plates, leaving you a pair of screens that can be adapted to something else. At least, I sure did not see a use for those screens in the instructions. In fact, I think the entire card on which the p.e., decals, and tracks are attached come from one of the two kits as I do not see but one of the various decal markings used. The kit itself is still very well molded with crisp details and hollowed out main gun barrel. This kit has the DS tracks which are quite flexible and easy to paint and glue. Instructions are a single folded sheet with five construction steps. No color info is provided during the build, with all that offered on its own page and in full color. The only tank provided is the box art vehicle. Just about all these tanks were too late to see combat except for a few in Manchuria and Korea that were used against the Soviets in the last days of the war. The tank is in the standard green, brown and tan disruptive scheme. The small decal sheet proved impervious to scanning as all the characters are in white on a very light blue background. It is nice to see another small scale Japanese tank added to the mix. I find it interesting that none of these seem to have made the transition to 1/35 scale like many other Dragon kits. Regardless, it should prove to be a pretty quick build and look nice on your display shelf.